We’re looking to raise as much as we can to be used as cash prizes in the top 3 tiers of European 9v9 – Premiership, High and Mid. Why should I donate just for the Premiership Players?! Funds and Items raised through the fundraiser will be used for prizes in hopefully all four tiers – Premiership, High, Mid and Open. Prizes for everyone! Clearly we do not know exactly how much will be raised, but we hope we’ll be able to provide prizes for all tiers. Bundle #1 – 5€ donation: Receive an ‘ETF2L Donator’ Title on the Forums (similar to current Staff titles). Bundle #2 – 10€ donation: In addition to the perk above, entry towards a raffle to win a Tt eSPORTS’s Ventus X mouse, 2x Tt eSPORTS’s Dasher Extended Mouse pad, a Tt eSPORTS’s Cronos AD Headset , a Tt eSPORTS’s Core V21 mATX Micro Chassis, 2x Tt eSPORTS’s packages with 3x Riing fans and 10x serveme.tf Premium for 6 months each! Bundle #3 – 15€ donation: In addition to the perks above, you can let your weapon be signed by a prem player of your choice, you provide the weapon, we do the rest! Bundle #4 – 30€ donation: In addition to the perks above, you will receive an mentor session in the preferred way of the mentor. More detail about this can be found on the Fundraiser Page. T-Shirt – 40€ donation: This would include a custom made ETF2L T-Shirt and an ‘ETF2L Donator’ Title. Make sure to provide your size! Shipping limited to Europe. Bundle #5 – 50€ donation: In addition to the perks above (not including the mentor session) , Receive a Custom Title on the ETF2L website. Bundle #6 – 60€ donation: In addition to the perks above (not including the mentor session), you will receive a custom made ETF2L T-Shirt! Make sure to provide your size! Shipping limited to Europe. Bundle #7 – 70€ donation: Upgrade the T-Shirt with your own personal (nick)name on it! Bundle #8 – 100€ donation: Always wanted to get your game casted professionally? sigafoo will cast one season 10 game of your choice live on BlackOut TV (date has to be arranged with the crew). This perk includes Weapons signing, Raffle entry, Custom Title on the ETF2L website. Got no cash, but still want to contribute nonetheless? We also accept item donations, especially unusual hats for the raffle and giftwraps for the weapon signings. We’ll provide a trade offer link once our fundraiser account is setup. Or just >>>click here<<< to donate! The T-shirt will look roughly like the picture shown below. The one with a nickname would have this written on the back in white letters. When donating for the perk that includes this make sure to provide your size! Shipping limited to Europe. Sizes can differ from S to XXXL. First off a big thanks to Tt eSPORTS’s and serveme.tf for donating the mentioned prizes. The raffle will include a Tt eSPORTS’s Ventus X mouse, 2x Tt eSPORTS’s Dasher Extended Mouse pad, a Tt eSPORTS’s Cronos AD Headset , a Tt eSPORTS’s Core V21 mATX Micro Chassis, 2x Tt eSPORTS’s packages with 3x Riing fans and 10x serveme.tf Premium for 6 months each, which grants you access to even more servers. Seventeen separate winners will be picked at random to win one prize each. Tt eSPORTS’s packages with 3x Riing fans can consist out of the following colors which can be decided by the winner: yellow, orange, blue, red, white, and green. The prizes can only be shipped inside Europe, additional shipping costs outside of Europe will have to be covered by the donator. These prizes will get distributed once the Indiegogo Campaign ends. The way they hold their mentor sessions is up to them but they’ll at least 1 session of 1 hour. Some of mentioned what they had in mind and that would be. Hildreth – Mostly it’s teams that require mentoring rather then individuals so I’ll most likely be up to spend an evening with your team! adysky – Preferably demoman map and positioning reviews or team sessions about strats and general flow of the game. Scissors – I’m up for whats requested, last time maptalks and teamtalks seemed to work really well! Khazul – Multiple group sessions that always bring something new and exciting! Klefsas – Long detailed maptalks focused on class cooperation and positioning with HL medic theory and perfect Russian accent as bonus. Piddox – I have experience with mentoring teams as well as individual heavy players. Get your weapon signed by (nearly) any player from season 9 Premiership! You must provide the weapon we’ll provide the gift wraps. Receive a Custom Title on the ETF2L forums, you may choose the exact wording however we reserve the right to deny anything we deem unsuitable or offensive. Limited to 21 characters. The Custom Title will look similar as the current Staff titles. Get Sigafoo to cast your ETF2L Season 10 Official live on BlackOut TV This has to be arranged with BlackOut TV on a suitable date and time to cast the official. Limited to 5 people. Share the fundraiser on social media, ingame and everywhere you can! 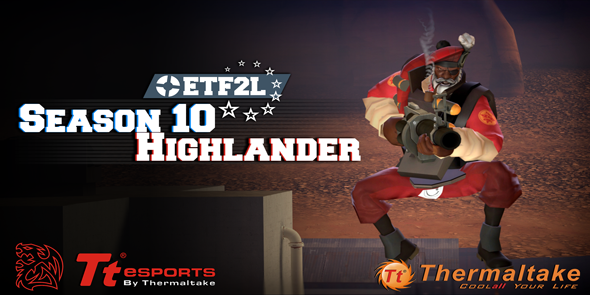 Let’s get as many people talking about ETF2L Season 10 powered by Tt eSPORTS as possible!Can’t support the fundraiser monetarily? We will be accepting in-game item donations to put towards the Open prize pool and also some Item Raffles in the future!